We have 8 leghorn hens that are about 5-6 months old. All of them now have droopy and black spotted combs. It has been very hot here, over 100 degrees. We give them plenty of water. Why do their combs look so bad? Sorry you are having the problem with your roos, Gayle. Thanks for sending the photo. Unfortunately there isn't enough detail, it's a bit dark and far away. I don't know what the combs looked like before, so not sure how changed the combs are. There is a possibility this is an avian pox virus. This is just a guess. 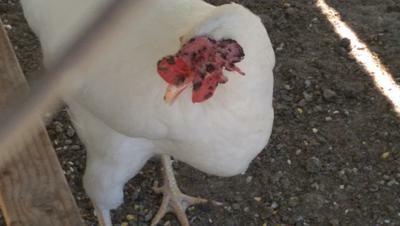 Or sometimes roosters pick on each other and the combs are just injured with dried blood spots. Small insects, including mites might be attached, are drawing blood and causing irritations that make the roos scratch at their combs. If these are not your only chickens, I would highly recommend keeping these separated until you find out what's going on. On the chance this is just a surface issue, not a virus, I would suggest using a triple anti-biotic ointment to coat the combs or vaseline. If these spots are wounds it will help them heal. If there are little parasites, the grease of the ointment will kill them. In a few days, I would suggest gently washing the combs with warm water and a wash cloth. Any surface matter or parasites should rinse off. If the combs don't clean up, you might be dealing with a virus. You would need veterinary testing done on one of them to know for sure. You could have mosquitoes biting their combs at night, causing irritations, scratching and bloody sores. Hopefully this IS just a surface issue and repeated treatments with vaseline or triple anti-biotic will help. I am kind of doubting that this is just a surface issue as the white feathers show no signs of blood staining. I would highly recommend getting veterinary assistance. You only need to take one of them to find out. Then you will know what to do for the group.